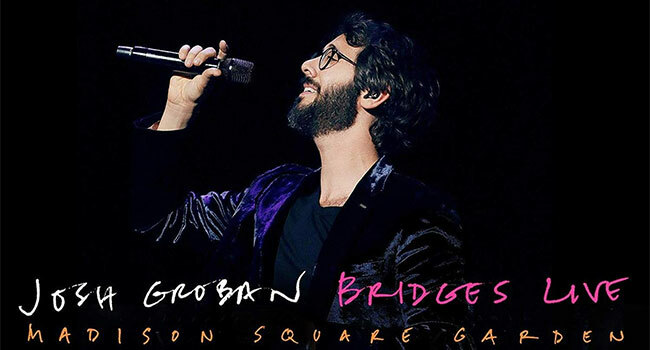 Multi-platinum award-winning singer, songwriter and global superstar Josh Groban will release a CD/DVD package entitled, Josh Groban Bridges Live: Madison Square Garden, this Friday, April 19th, via Reprise Records. Relive all of the exciting, tear-jerking and even comedic moments from the show, shot by famed director Joe Thomas and recorded live from the final US stop of his sold out 2018 Bridges Tour at the iconic Madison Square Garden. The show includes a mixture of new songs and classic hits as well as duets with Tony-Award winning, multi-platinum recording artist Idina Menzel along with a special appearance by Sugarland’s Jennifer Nettles. The accompanying live CD will feature fan favorites from the DVD and will also include a special, brand new bonus track, “She Moved Through the Fair,” recorded live from Dublin on the Bridges world tour. Groban will be heading out on the second leg of his Bridges Tour this summer with special guests singer-songwriter Jennifer Nettles and critically acclaimed instrumentalist, Chris Botti, joining him on select dates. Tickets for the summer tour are on sale now. Earlier this month, it was announced that Groban will be joining Celine Dion’s first ever headlining show in the Royal Park on July 5th with support from Claire Richards, as a part of British Summer Time. Tickets are available now.